Gregg Williams owes Peyton Manning a huge thank you. For the last two days, we’ve been speculating about where No. 18 could land in the coming week instead of discussing the bounty system the New Orleans Saints exercised the past three seasons. First, a quick synopsis: An investigative report revealed Williams placed bounties on opposing players. For example, a knockout was worth $1,500. A cart-off: $1,000. If you hit your bounty in the postseason, it doubled, even tripled in value. In all, it’s estimated that more than two dozen players were involved and up to $50,000 was paid out. After the news broke, Williams issued an apology. He and former players from around the league spoke out, including his former Saints, Bills and Redskins players. So did NFL Commissioner Roger Goodell, who simply said: “The bounty rule promotes two key elements of NFL football: player safety and competitive integrity." At this point, though, apologies are meaningless. To be blunt, Williams is screwed. Goodell earns his paycheck for being a strict disciplinarian. From a public relations standpoint, the league has to rule on this matter with an iron fist to save face and prove they view player safety as a top priority. Let’s formulate the punishment. Pittsburgh Steelers linebacker has accumulated more than $125,000 in fines his the last two years – that’s more than most citizens’ annual income. One hit on Cleveland Browns receiver Mohamed Massaquoi $75,000; another on quarterback Colt McCoy resulted in a one-game suspension. In 2007, after Spygate surfaced, New England Patriots head coach Bill Belichick was slapped with a $500,000 fine, the maximum allowed by the league and the most ever in NFL history. If I were Goodell, I’d issue a $500,000 fine. In addition, I’d suspend him for the entire 2012-2013 season. Reason being: Harrison is reckless with his hits. His punishments followed an ascending latter of fines until he reached his suspension. But that’s just one player. 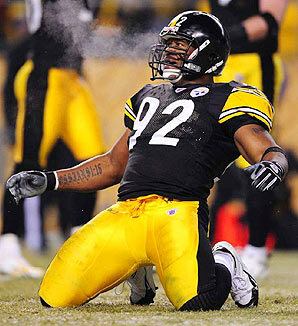 Williams encouraged James Harrison-esque behavior to up to 27 players, promoting serious, career-threatening injuries. Essentially, he told his players he doesn’t think he can beat Brett Favre, so take out his sore ankle. He said you can’t stop Kurt Warner; force his backup into the game. That’s not sane or humane. Former Jets and Chargers running back LaDainian Tomlinson told 1090-AM in San Diego: “I think it's kind of part of the game …I mean to be honest with you I don't think you can discipline them guys too much." out [of the game], they will." I don’t think Williams is the first coach to employ a bounty system. It just feels like he was the first one to get caught. Just speculating, but would you be shocked if you heard a guy like Rex Ryan tell Bat Scott to go take a shot at Brady’s knee? What if you found out Rob Ryan asked DaMarcus Ware to give Eli a hit to the shoulder after the whistle? Heck, I wouldn’t even rule out a guy like a Jim Harbaugh. 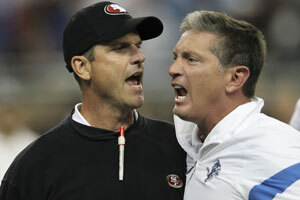 The 49ers head coach talked smack right into Jim Schwartz’s face after a win, then refused to shake his hand because he is such a fiery competitor. In the heat of the moment, couldn’t you see Harbaugh encouraging his defensive players to put it all out on the line and deliver a crushing blow? I think this happens more often than we think. Should it be tolerated – that’s an entirely different story. How can the league monitor what defensive coordinators say to their players to fire them up before games? You’re right. They can’t. So go ahead, fine and suspend Williams all you want. Extract as many draft picks from the Saints as you can. Regardless, there’s a violent culture in the NFL, and there should be. As you’ve seen with Harrison, fines and suspensions doesn’t discourage big-time hits. That’s how players were taught and are accustomed to playing. And that’s just how some coaches motivate their players.